"It was a panic attack", I explained to Sam. It's happened to me before so I know the symptoms and overall feeling. At the time he told me to sit down, take deep breaths, use my inhaler, and drink some water. After some time, it worked, and things became balanced. The problem is I don't know what exactly started it from a psychological perspective and I don't know why I still have remnants of it. At the time the contributing factor was a coconut based food item and my constant fear that I will develop the same allergy as the rest of my family as I age. I have seen an allergist and received testing to confirm that I am in fact not allergic and it is "all in my head and due to stress". Yet I can't be around a nut product knowingly and not have it be a trigger. It's a day shy of a week since the incident and I still have the heavy restricting feeling in my chest. On occasion my heart races and the panicking gets worse. Why? I know there is a lot going on in decision land and I am still preoccupied with the loss of her CDKL5 brother, Jakob. I just don't know how to shake it off, and I don't know how long it will last. Will my life always be like this or does it eventually get easier to compartmentalize all of my thoughts and emotions? I have done so much better the last couple of months taking care of myself and making sure I take me time. I should probably curb my coffee intake and maybe sleep more than 3 hours a night, but truth be told I don't think either of those are possible right now. I don't know how to make these attacks stop and I don't think they will on their own...so I guess the next step is just learning how to handle them because they are probably par for the course. I wanted to count the number of posts that I have written that involved decision-making, and then I realized there were far too many to count. The majority of our situations involve making choices between two unfavorable options, yet deciding which will hopefully be the least disruptive to whatever balance we have currently stumbled upon. 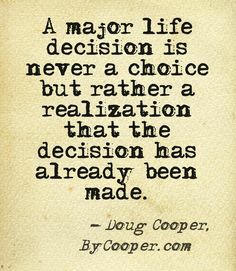 I know deep down the results of our choices are not based on whether we made the right or wrong choice, but it never makes me feel any better when the outcome is not what we had hoped. Here we are again at our friendly little fork in the road. This one both Sam and myself saw coming, so we have talked about what we think would be best for some time now. However, discussing the potential scenarios and actually living them are entirely different. I always think I am prepared until the day comes that the doctor looks at us and says, "I feel comfortable and I think it is time that we go ahead with XYZ, now you and Sam have to make the final decision". I do not know why all of my confidence flies out of the window and the panic attack sets in at that moment, but it has happened every time without fail. When Sonzee was placed on intestinal feeds back in May, it was to save her life. Thankfully it did the job, and so making the decision to have a tube come out of her nose and go through her body was not even a smidgen challenging. Placing a tube on her face went against everything I had wanted for her, knowing how much it would bother her, knowing that it can cause feeding difficulties in the long run, knowing that it would be an attention grabber while she was out in public and cause excessive staring. She has lived with a tube on her face for 6 months, and while it is not ideal, we are all used to it. Truth be told having a blinking sign indicating that I am aware something is wrong with my child actually makes me feel comforted while we are out in public. Today we were told that she will not be starting stomach feeding in the foreseeable future and so her GI team feels comfortable with moving the tube off her face and changing her stomach tube to a stomach/intestinal tube. It is not to say her stomach will not work ever, but CDKL5 has not been kind to her GI system. We have wanted this tube relocated for so long; I am unsure why I am nauseous at this thought. I know there is a part of me that is sad that her stomach was not able to start working again by this point. I know there is a part of me that worries once we do this, it never will. I know there is a part of me that fears this "outpatient" procedure will go completely wrong, despite the fact that "complications are rare AND it is outpatient". I know there is a part of me that worries this will only aggravate her stomach more, causing her more pain and discomfort and constant venting (releasing the contents of the stomach so that they don't just sit there). I know I am afraid of tipping the boat since it has been rocking already for 6 weeks and we are finally getting our happy bear back. What I think is my biggest challenge right now is knowing what our answer is, but fearing the outcome. We had a great Thanksgiving day with some close friends of ours and then we put the big kids to sleep. Sonzee fell asleep in her favorite spot on the floor and then I went onto Facebook. As one of the admins of the CDKL5 support group I receive notifications when a person makes a post. I typically pop over to see what information is being shared or what question is being asked...and that's when I read the news. The news I foreshadowed as the season began to change almost a month ago, the news that the entire CDKL5 family dreads...the news that informs us that we have lost another precious CDKL5 family member. Instantly my heart begins to ache as it simultaneously breaks, my chest begins to tighten, and my pulse increases. Unfortunately I know this feeling all too well because our CDKL5 family endures these losses far too often. It is a mixture of pain for the family, panic that we could be next, relief for the child that he (in this case) is no longer suffering, anger that this child and his family had to deal with CDKL5, and sheer frustration that in 2016 science hasn't found a way to fix or eliminate genetic mutations such as CDKL5. No matter how optimistic, hopeful, or positive we are as parents of a child with a CDKL5 mutation there is no winning. We do our best to make our children as happy and loved as possible. We give them as many opportunities to thrive as we possibly can. We make decisions that will hopefully only increase our child's quality of life. But in the end no matter what we do, we can't beat the CDKL5 mutations themselves. As the holiday season officially begins as well as #GivingTuesday this Tuesday, I ask you all to consider giving a tax deductible donation to Sonya's Story to help fund crucial research (such as keeping Hope4Harper's cell line maintained for a year) so that posts like this one don't have to continue happening. I ask you to consider buying Sonya's Story and CDKL5 apparel to help spread awareness of CDKL5 (all proceeds from those sales go directly to Sonya's Story to be given to research institutions to help us find a cure). I encourage you to help us find a cure! So much has happened in our lives since Thanksgiving of 2015. As I take a look at our "year in review" it is brings up a multitude of emotions. There were days that were just so amazing it is challenging to give them justice with only words. At the same time, there were days I would rather have never had and wish I could forget. As a family, we participated in some experiences that were no different from years past, but there were also new ones. No matter what the outcome of each one was, the experience itself continues to mold me, strengthen me, and help me to complete my purpose here on earth. I know the same holds true for Sonzee and all of our children. As I read the quote posted above and I apply it to Sonzee, I am so thankful that she is laying in her favorite position on the floor half in her sensory box with her right thumb in her mouth and asleep. She has managed to be outpatient for 28 days (hmm, I see that must be our magic number), we may finally have a solution to her GI issues and she has a new activity chair that makes her capable of being an active member of our family. There are so many things to be thankful for when it comes to how she is doing and I am so thankful that this is where she is meant to be. I think this is going to be one of those refrigerator magnet types of quotes for me. 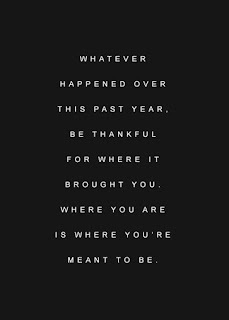 While there were many outcomes that occurred for me personally over this past year that I may not have agreed with, they needed to happen for me to be where I am at emotionally, physically, and spiritually. 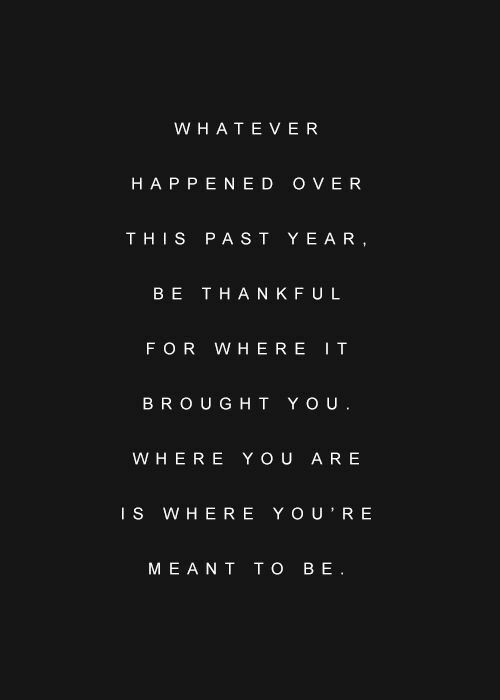 While all of those are different than where I was typing my Thanksgiving post one year ago, and while I may not be 100% okay with that now or for whatever is in store for me over the next year...it will always be exactly where and how it is meant to be. This week in our CDKL5 support group we welcomed so many new families who have babies. I now consider anyone younger than Sonzee a baby and I am struggling with the realization that in just three short months she will be two. This is a challenging concept to wrap my head around for so many reasons; I am having trouble picking the ones to focus on for this post. With the challenges her 21 months of life have thrown at her, I am really proud and content with the place she is currently, however, I cannot ignore the elephant in the room that says, "None of the past 21 months has been normal, and none of it is fair". I really think that the best lesson of my life I learned in 5th grade with Miss Bailey when she introduced our class to the word "impartial" with the sentence, "Life is not impartial". Nothing like a great review of 21 months to say, "Miss Bailey, you were absolutely correct". Sonzee is alive, she is absorbing food, she is healthy..., but we should not have to think about these things. I should be chasing a toddler around my house; picking her up from the ground as she falls as she runs after her siblings trying to join in their shenanigans. I should be enrolling her into dance class with Miss Jenny and Miss Emily. She should be running around the gym with Coach Susan. The appointments I make should not be with neurology, gastroenterology, pulmonology, ophthalmology, and/or interventional radiology. I should not be parking in a handicap parking space and unfolding a stroller with a blue placard that explains it is being used as a wheelchair. My favorite part of having three girls is opening up the drawer of clothing and reminiscing over what her sisters did while wearing each outfit, knowing how every fade, stain, and spot was caused. I love when her sister says "that laeya's? That not mine. That Sonzee’s?" Words I most likely will not ever hear come from Sonzee's mouth. The clothing will be passed down to her baby cousin, and it will bring me so much joy and happiness to watch her do the things in them that Sonzee has not, but it will also sting. This is not how it is supposed to be. My heart hurts. When I look at Sonzee while she is in the pool with children her age it is completely mind boggling that they are the same age. When children her age walk up to the stroller it stings when they say "baby", not because they are calling her a "baby", but because they are absolutely correct, she looks and acts like a baby. It is the truth that hurts. It is our current situation that is painful. I do not understand why this had to happen to her. I honestly do not try to make heads or tails of it, but I wish I knew why she has to suffer. As each day goes by I am so thankful that she is still here with us, but it also gets scarier for me to think "how much time does she have left". While I am being honest, there are days when her suffering is just so horrific that I wonder, "Which outcome is better for her?" There have been days during the past 21 months that I have wondered which box to check off when they ask about 911 or comfort measures. These are not the type of parenting questions I should be answering about my 21-month-old child. This is not fair. There have been many positives that have occurred over the past 21 months, but none of them came without having to battle. Nothing since her birth has been easy, and nothing about her future will be either. Each day since her birth I have lived on a tight rope trying to balance. The atmosphere in our lives each day over the past 21 months has been dictated by how she feels. We live in a constant state of limbo while walking on eggshells hoping and praying that no matter what, a rebound will occur. As I previously stated, today things are going well because things are going well for Sonzee, but it does not change the aching pit in my stomach of how different this life is from the one I envisioned. I wish our family had never known of CDKL5, but as I learned in grade school about 22 years ago...life is not impartial. I was on the brink of needing to cork the good ole' wine bottle prior to getting the older kids into their beds last night when Sonzee was asleep during the prescheduled live video feed of her getting her glasses. For a good while I was on the verge of tears because "why can't just one thing go the way I planned it". I sat in the corner of our couch and stared into my phone sending sad faces emojis and negative words to a close friend. Then I took a cute picture of her peacefully sleeping and made a post to let her story tellers know the live video would be postponed. After some time went by I looked over at her mat and I saw her eyes were blinking..."YES! She is awake, live feed of glasses is on!" I am pretty sure I said that aloud as well in my head. Part of me ecstatic, the other part slightly nervous. This is the Sonze we are talking about, if she isn't in the mood, well than we might as well stick to regular evening programming because this could get ugly really really fast! I had spent a good portion of the afternoon thinking about what would be the best position for her to be in, what toys would be best for her "first time seeing" and reminding myself multiple times that this could very well be "disappointing" in terms of her reaction so I shouldn't get my hopes up too high. When it was time to start the live feed I was beyond nervous. Talking to groups of people isn't exactly my favorite thing AND I had not planned on being in the video, so I apologize about the clothing malfunctions (oops!). Besides the video itself being more amazing than my wildest dreams could ever have envisioned, when I look back on how the evenings events went I actually am pretty excited about something that I never considered. I had been down in the dumps about little bear falling asleep, I was a bit nervous when she started to cry when we made our first attempt at getting the glasses on her face, but the fact that it played out the way it did made me smile because it really is normal to have a 21 month old do everything she did! What 21 month old naps when you want him/her to? What 21 month old "cooperates"? What 21 month old wants a band around his/her head? (So many people mentioned this was a problem for their child and I merely shrugged it off thinking how Sonzee isn't fazed like typical kids). What 21 month old is happy 24/7? While there is plenty that is different about Sonzee and all of her same aged peers...just this once it was nice to realize everything she did was just "normal." There are so many challenging parts of having a child with CDKL5 that I find myself starting a post with "one of the most challenging parts of being a parent to a child with CDKL5" more often than not. Yet again here I am finding no other way to start today's post...other than...one of the most challenging parts of being a parent to a child who has a CDKL5 mutation is constantly having to take leaps of faith. There is really no other way to live this life without constantly having to throw your hands up in the air saying "I quit" and just giving in to whatever is instore. Sometimes you get lucky and the outcome "works in your child's favor", more often than not, you are left angry that you, your family, and especially your child are in this predicament, and that you actually felt the slightest tinge of hope that things would "work out". It is usually after you have exhausted the 10 most common of solutions that you allow yourself to go to the next level of solutions that you normally wouldn't ever consider, but now you really have nothing to lose. The sad part is, at this level of options there is always something that is being sacrificed, but it is the lesser of all the evils your child is facing. It is so infuriating to be placed in this position, but then again nothing is inviting about holding a CDKL5 parenting position. So here we are...again...being faced with making a decision that doesn't come without a consequence but if it is successful could prove to be one of the MOST beneficial outcomes for our little bear. The balance of the side effects of her new medication weighed against the possibility that her pain could become obsolete makes it a "no brainer" at this time. So with the notion that this could be Sonzee's saving grace, we again hold our breath and take another leap of faith. It happens all the time after I tell someone about Sonzee. The innocent follow up question is always "what do the doctors say for the long term?” This usually results in me telling them while the spectrum of her disorder varies, most children with her disorder do not walk, talk, or feed themselves on their own. I always state we will do whatever we can for her, we are not saying never, but her disorder is limiting, in all ways. This is then followed by the seemingly innocent comparison. The one where the person is trying to maybe instill some hope into my life by saying that their child, a friend’s child, or a child of a second cousin twice removed has epilepsy and they are graduating from Yale or some other Ivy League college. (To be honest, Ivy League schools are not really on my wish list for any of my children, but I digress). While the statement seems "benign", what I would love people to know is that the comparison to your child, your friend's child, or your cousin's child twice removed, is actually unfair. CDKL5 and many genetic disorders are limiting in the fact that they are genetic. When a gene in a body is incomplete, missing, or has an error it has a catastrophic impact on all areas of development. There is no medication that can fix it; there is no "system reboot" that can be completed. There is absolutely nothing that can be done to actually make the bodywork normally. Symptoms can be treated to an extent, maybe Sonya's seizures will one day be completely under control, but even if that happens, she will always have an abnormal mutation on her CDKL5 gene. This means that the comparison might as well be apples to oranges. We can spend thousands of dollars on therapies, we can place her in every therapy the world has to offer, and they will help her, but they will not ever make her act like or be a typical child. When I am told that "doctors can be wrong", yes they can be, but not with CDKL5. I wish people did not feel the need to create small talk by saying "you never know what might happen". You are absolutely correct, I do not, however unless it involves a vial of CDKL5 capable of replacing the frameshift mutation on Sonzee's, than I am 99% certain that attending (an Ivy League) college will not be in her cards (but she will be happy to accept an honorary degree from one).